The Saguaro, pronounced "sah-wah-roh", (Carnegiea gigantea) is a large, tree-sized cactus species in the monotypic genus Carnegiea. It is native to the Sonoran Desert in Arizona, the Mexican states of Sonora and Baja California, and an extremely small area of California. 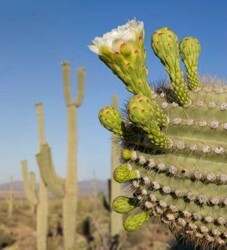 The saguaro blossom is the state flower of Arizona. The common name of the cactus, saguaro, is a Spanish-language adaptation of a word used by a local aboriginal American nation, the Tohono O'odham, for the plant. Saguaros have a relatively long life span. They take up to 75 years to develop a side arm. The arms themselves are grown to increase the plant's reproductive capacity (more apices equal more flowers and fruit). The growth rate of saguaros is strongly dependent on local precipitation patterns, and saguaros in drier western Arizona grow only half as fast as those in and around Tucson, Arizona. Some specimens may live for more than 150 years; the champion saguaro grows in Maricopa County, Arizona and is 13.8 meters (45.3 ft) tall with a girth of 3.1 meters (10 ft). (It was injured as a result of the Cave Creek Complex fire in June 2005.) 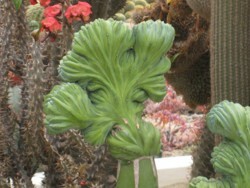 In addition to being slow growing, they are also slow to propagate. Harming one in any manner (including cactus plugging) is illegal by state law in Arizona, and when houses or highways are built, special permits must be obtained to move or destroy any saguaro affected. The spines on smaller saguaro (having a height less than 2 meters or 6 feet) grow rapidly, up to a millimeter per day. When held up to the light or bisected, alternating light and dark bands transverse to the long axis of spines can be seen. These "transverse bands" have been correlated to daily growth (one light/dark couplet equals one day of growth). 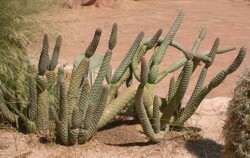 In columnar cacti, spines almost always grow from the apex of the plant and then cease to grow as they are moved to the side and the apex continues to grow upwards. 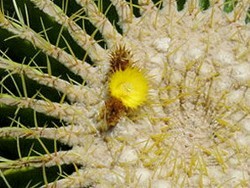 Thus, the older spines are towards the base of a columnar cactus and newer spines are near the apex. Current studies are underway to examine the relationship of carbon and isotope ratios in the tissues of spines to the past climate and photosynthetic history of the plant. The night blooming flowers appear April-May and the sweet, ruby-colored fruit matures by late June. Each fruit can contain up to 2,000 seeds. Saguaro flowers are self incompatible and require a pollenizer to supply viable pollen. A well-pollinated fruit will contain several thousand tiny seeds, and large quantities of pollen are required for pollination. The major pollinators are bats, primarily the Lesser Long-nosed Bat, feeding on the nectar from the night-blooming flowers, which often remain open in the morning. The characteristics of the flower are geared toward pollination by the bats: the nocturnal opening of the flowers, maturation of pollen, and the nectar. Peruvian Torch cactus (Echinopsis peruviana syn. Trichocereus peruvianus) is a fast-growing columnar cactus native to the western slope of the Andes in Peru, between about 2000-3000 meters above sea level. The plant is bluish-green in colour, with frosted stems, and 6-8 broadly rounded ribs; it has large, white flowers. It can grow up to 7 meters tall, with stems up to 20 cm in diameter; it is fully erect to begin with, but later possibly arching over, or even becoming prostrate. Groups of 6-8 honey-coloured to brown rigid spines, up to 4 cm in length, with most about 1 cm, are located at the nodes, which are evenly spaced along the ribs, up to approximately 2.5 cm apart. A short-spined variant which is nearly identical in appearance to its relative, Echinopsis pachanoi (San Pedro cactus), is known. It is therefore possible that many misidentified plants are being sold (both as Peruvian Torch and as San Pedro), but since local variations as well as hybrids do exist (both cultivated and natural), this will obviously make proper identification difficult. Echinocactus grusonii is a well known species of cactus native to central Mexico from San Luis Potosi to Hidalgo. 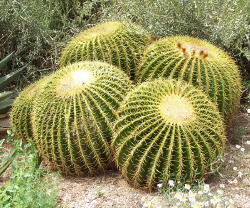 Described by Heinrich Hildmann in 1891, it is popularly known as the Golden Barrel Cactus, Golden Ball or, amusingly, Mother-in-Law's Cushion. It belongs to the small genus Echinocactus, which together with the related genus Ferocactus, are commonly referred to as barrel cacti. 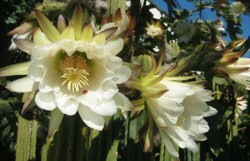 FlowerDespite being one of the most popular cacti in cultivation, it is rare and critically endangered in the wild. Growing as a large roughly spherical globe, it may eventually reach over a meter in height after many years. There may be up to 35 pronounced ribs in mature plants, though they are not evident in young plants, which may have a knobbly appearance. Note: Younger Golden Barrels do not look similar to the mature ones. The sharp spines are long, straight or slightly curved, and various shades of yellow or, occasionally, white. Small yellow flowers appear in summer around the crown of the plant, but only after twenty years or so. Mutation of Myrtillocactus geometrizans (Blue Myrtle, Bilberry Cactus, Whortleberry Cactus or Blue Candle) is a species of cactus in the genus Myrtillocactus, native to central and northern Mexico. 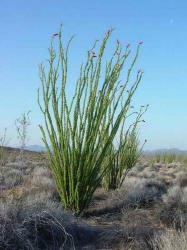 It is a large shrubby cactus growing to 4�5 m tall, with candelabra-like branching on mature plants. The individual stems are 6�10 cm diameter, with five (occasionally six) ribs, with areoles spaced 1.5�3 cm apart. The flowers are creamy white, 2�2.5 cm diameter. The fruit is an edible dark purple berry 1�2 cm diameter, superficially resembling Vaccinium myrtillus (Bilberry or Whortleberry) fruit; both the scientific and English names derive from this resemblance. It is a popular species in cultivation, where young plants commonly remain unbranched for many years. The fruit is edible, and sold for consumption in Mexico. 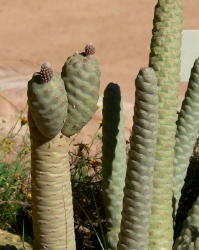 The cactus is fast growing, and is often used as grafting stock because of this. It can reach heights of up to 1.2 metres, although commonly only growing to around 10" (about 26 cm). Opuntia ficus-indica (Indian Fig Opuntia) is a species of cactus and a long-domesticated crop plant important in agricultural economies throughout arid and semiarid parts of the world. 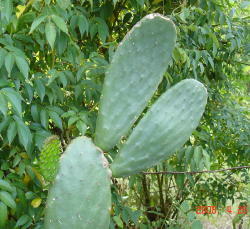 Indian Fig Opuntia is grown primarily as a fruit crop, but also for the vegetable nopales and other uses. 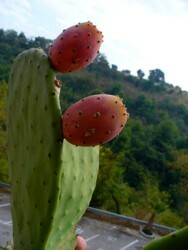 Most culinary references to the "prickly pear" are referring to this species. The name "tuna" is also used for the fruit of this cactus, and for Opuntia in general (according to Alexander von Humboldt, it was a word of Haitian origin taken into the Spanish language around 1500). 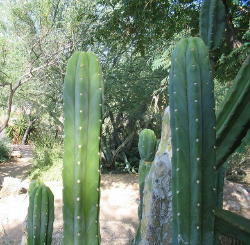 Cacti are good crops for dry areas because they efficiently convert water into biomass. 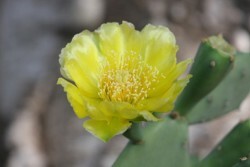 Opuntia ficus-indica, as the most widespread of the long-domesticated cactuses, is as economically important as corn and tequila agave in Mexico today. Because Opuntia species hybridize easily (much like oaks), the wild origin of Opuntia ficus-indica is likely to have been Mexico due to the fact that its close genetic relatives are found in central Mexico. The San Pedro cactus (Echinopsis pachanoi, syn. Trichocereus pachanoi) is a fast-growing columnar cactus native to the Andes Mountains of Peru between 2000�3000 m in altitude. 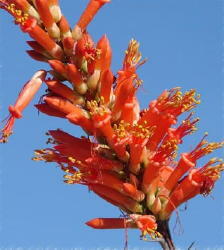 It is also found in Bolivia, Chile and Ecuador, and it is cultivated in other parts of the world. Uses for it include traditional medicine and traditional veterinary medicine, and it is widely grown as an ornamental cactus. It has been used for healing and religious divination in the Andes Mountains region for over 3000 years. 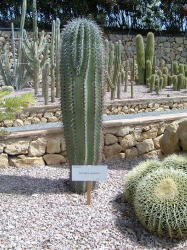 It is sometimes confused with its close relative, Echinopsis peruviana (Peruvian Torch Cactus).